I don’t know about you, but I love leeks. They have such a delicate and sweet flavor, so unlike their more robust onion cousins. I have paired them with salmon to make this delicious, creamy Leek & Salmon Soup. There’s something really wonderful about the richness of salmon as it plays against the sweet vegetable here. I came up with this recipe because Mr Meatified really doesn’t care for salmon very much, but I wanted him to get some of the benefits of eating it. 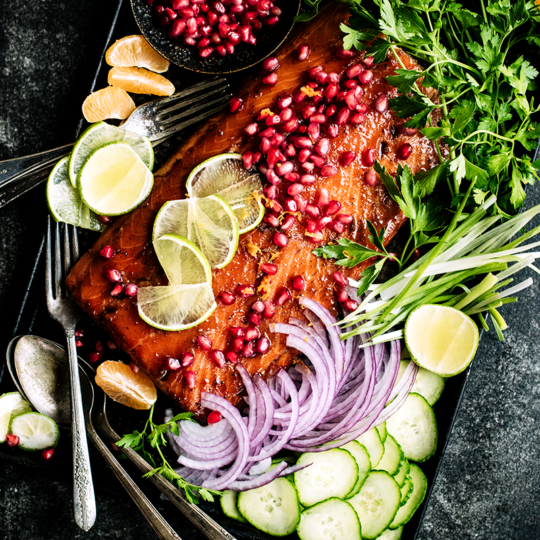 Salmon is rich in omega-3 fatty acids, vitamin D and selenium, all of which are great for reducing inflammation in the body. Definitely a good thing: make sure you are eating healthy wild caught oily fish! This salmon soup has lots of other positive points going its favor, too. I used thawed frozen salmon, which makes it super economical. This Leek & Salmon Soup stretches 1 lb of salmon into 4 generous dinner sized servings of soup! It’s also FAST. You can have a hot steaming bowl of homemade soup on the table in about half an hour AND all the ingredients used are common enough that you probably have all of them in your home already! Yay! The creaminess, of course, comes from the addition of coconut milk to the broth at the end. One thing that really is essential here is the thyme: it marries together all of the other flavors beautifully. I used dried because that’s what I had, but I can only imagine how good this would taste if you used the fresh herb! Whatever you use, this Leek and Salmon Soup is a fantastic recipe to have in your stash because it’s simple, fast and gosh darn tasty! This dairy free creamy salmon soup is made even more delicious by the addition of leeks and thyme. Perfect comfort food that’s ready in 30 minutes or less! Lovely recipe. I adore anything with salmon. Great way to skip dairy. The salmon soups I’ve had all seem to have dairy. I will have to give coconut a try. Thank you! The other thing I’ve tried for an extra creamy soup is to use coconut milk and then puree some white sweet potato into the soup as well. I did that here to make a dairy free “chowder”. You do get a little sweetness that way, but it’s not totally overwhelming. This was seriously the best soup I have ever had! Oh my goodness, I just made this and it is absolutely heavenly. So easy but tastes like it came out of a five star restaurant. Kudos! Would love to make this and I have all the ingredients except leeks. I know you love leeks, but think this could work with green onion? I know the end result would not be the same, but hopefully still good, no? 🙂 Also, thank you for the plethora of gourmet looking AIP recipes. I am just starting, and seeing all these delicious options does not make me feel “deprived” AT ALL! You could try those and adding in an onion or so for bulk would help, too! So good!!! Eating it right now and so glad to have this recipe! Can i use some other kind of milk for the creaminess? Have nut allergies and stay away form soy..coconut may be an issue, so what about hemp milk? This is a beautiful delicate soup, not lacking in flavour or overwhelming. I adored it!